Climate Change: Is There Hope for an International Response? Was Hurricane Sandy the result of global warming? Many scientists are reluctant to directly attribute this and other recent superstorms to global warming. However, it is very likely effects from climate change are influencing the severity of these storms. With the scientific world approaching a consensus that human activity is contributing to climate change, pressure is mounting on the international community to respond. 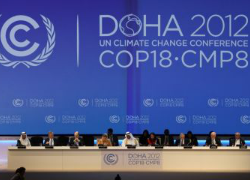 Delegates, nongovernmental organizations, and environmentalists from over 200 countries are currently converging at the United Nations climate-change summit in Qatar to debate the issue. The underlying goal of the conference, ending on December 7, is to slow global warming, specifically to “pave the way toward a world treaty, to be signed in 2015, aimed at slowing global emissions of heat-trapping fossil-fuel pollution enough to keep the planet’s temperature from rising by 2 degrees Celsius (3.6 degrees Fahrenheit).” Scientists fear a sustained increase above two degrees Celsius will lead to a chain reaction of extreme events, such as rapid sea level rise, widespread flooding, extreme weather, and food shortages. However, skepticism surrounds the summit. For one, ongoing global temperature increase is feared to be all but certain. A recent study funded by the National Science Foundation concluded that “[d]espite efforts to reduce greenhouse gas emissions, global warming and a greater increase in sea level are inevitable during this century.” Also, the summit’s goal of extending the 1997 Kyoto Protocol appears to be losing ground. The treaty, which expires at the end of 2012, is the only legally binding U.N. pact addressing global warming. It calls on wealthier governments to limit carbon emissions through restrictions on their businesses and citizens. However, the U.S. declined to ratify the original treaty, and now others – including Russia, Canada, and Japan – are unlikely to sign the extension. While the effect of the U.N. summit is currently in doubt, it should be noted that many individual countries are taking domestic action to reduce their contribution to climate change. For instance, Mexico adopted a national law to reduce carbon emissions by thirty percent from “business-as-usual levels” by 2020, and fifty percent from the 2000 levels by 2050; South Korea approved a mandatory carbon trading program affecting some of its biggest polluters; and the European Union recently put into effect a program to reduce carbon pollution from aviation. As for the United States, fuel efficiency standards were sharply improved under the Obama administration, and the President has expressed plans to adopt a more proactive approach to global warming during his second term. However, climate change is a global issue requiring an international response. Unfortunately the U.N. summit in Qatar appears unlikely to produce immediate results. The only hope is that it will lay a foundation for future cooperation and resolutions.